Reaching the moon was certainly a giant leap for mankind to reach the moon but there were so many more unknowns further a-field. It was time for a mission to explore the outer edges of the solar system: Voyager. Izzie Clarke and Katie Haylor were joined by astronomy journalist Dr Stuart Clark and musicians, Greg Spawton and David Longdon, from Big Big Train. Stuart - Yes. There were these two strands towards the NASA exploration program; one was the human missions, and I think generally people thought after the moon they go on to Mars and do all those kinds of things, and in order to do that they started to build these robotic spacecraft that they could send ahead and be looking at these worlds. And so whilst the outer solar system was not yet on the horizon for human missions - and still isn't - you still wanted to see it. Izzie - With scanning our solar system, how did Voyager actually do that? Stuart - Voyager did that by visiting in turn each of the four outer gas giant planets; Jupiter, Saturn, Uranus and Neptune. These are worlds that are utterly unlike Earth, they have no solid surface to speak of, they're just gigantic atmospheres. So they're truly alien worlds. And so we wanted to see those to understand what these kinds of giant worlds could actually look like. Izzie - How did it begin? Was it always just to set out to look at two planets, or four planets, or what? Stuart - Yes. In the mid 1960s a NASA engineer called Gary Flandro realised that there was an alignment of the four outer planets in the solar system and these planets: Jupiter, Saturn, Uranus and Neptune, they would allow a mission to visit each planet in turn. And this configuration of the planets would occur next in a hundred and seventy years. It was a case of now or never. NASA went for it. 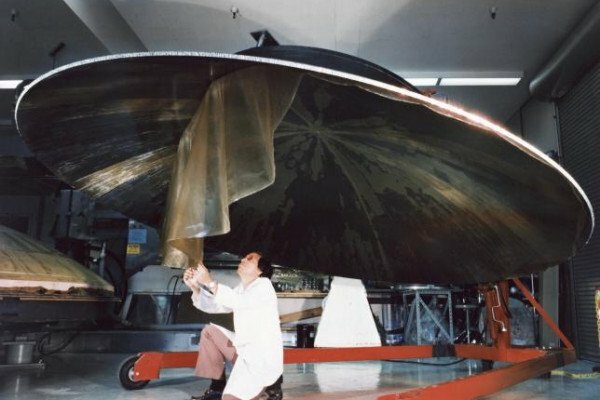 They designed a mission concept called “The Grand Tour” and then gradually through funding cuts and thinking that that was a bit too ambitious, it got whittled down into these Voyager mission which was really only designed to go to Jupiter and Saturn. But the engineers, when they were making the spacecraft, they made sure that they designed it so that if the funding became available it could go on and see Uranus and Neptune as well. Izzie - A bit of a sneaky reserve just in case. But there were two probes within this, Voyager 1 and Voyager 2. Why was that exactly? Stuart - The two spacecraft were for different reasons in fact. There was a large school of thought that one of the most interesting places you could look at in the solar system was Saturn's moon Titan. Because Titan is the only moon that has an appreciable atmosphere. Some people thought it might even be exactly what Earth looked like billions of years ago before life began. So it seemed to a lot of people that it was critical that you had a close up look at Titan. To do that, however, meant directing the space probe in a way that you would not then be able to go on and do the grand tour. The two spacecraft: one would do the grand tour, one would look at Titan. But also they were insurance. They were backup because these were the early days of space exploration. The spacecraft themselves, with the best will in the world, were a bit glitchy sometimes. So if you built and sent two, if one failed, you had another one that could do the prime mission. Izzie - And so we mentioned that going to Titan and trying to do this grand tour. What were the major findings of this mission? Izzie - I bet. Before that point, as you mentioned, looking at these planets, with the technology, it would have been this really fuzzy tiny thing. You wouldn't have got so close to these planets which are further afield. Stuart - Absolutely. So you could do some spectral analysis on the light so you could get a glimpse of their compositions. They were worlds of mystery, tantalizing mysteries, that were suddenly there. Fully formed worlds in front of you. And better than you could possibly have imagined. Izzie - And what’s even more incredible is that it is still going today. Forty one years later and three months. Where is it and how is that even possible? Stuart - It's quite amazing, isn't it? Voyager 1 is now in interstellar space. It's about 17 light hours away from us, something in that order. And we've never had a spacecraft that far from the sun before. We're in a part of space now where the sun's magnetic influence is not the dominant thing. Here on Earth, and through the solar system, we live in that magnetic influence and out there Voyager 1 is still recording data about the particles, the way the fields work out there, and sending it back to us. Izzie - Really venturing into the unknown. Well Stuart, thank you very much. We'll come back to you later in the program. Katie - Now also with us are Greg Spawton and David Longdon from the band Big Big Train. You guys have certainly been inspired by Voyager - and you've got an album coming out about exploration - including a song about this particular mission. Greg, first of all, what was it about Voyager that made you turn this particular mission into music? Greg - I think it was the magic of the events in the 70s, for me. David and I are both born in ‘65 which is the year that the mission was conceived and we were twelve years old when the ships launched. What's been great about the missions is they've been so long lasting, we've been able to kind of re-engage with them throughout our adult life. Even now, 40 years on, we're still re-engaging with these incredible craft that have achieved things that are beyond my imagination really. It's a huge story, it's probably mankind's longest story that will ever tell, and we think it's worthy of a tune or two. Katie - It's a long mission, we've heard it's still going, so it must be a long song? Greg - Yes it is. [Laughter]. We work in a field called progressive rock and one of the great things about prog rock is that we’re not limited to four minute or three minute tunes. It’s not radio friendly stuff. This is a big subject and the song is about 14 15 minutes long. It allows us to tell the poetry of the tale, really, over a period of music. Katie - I mean that's what I was going to ask… We’ll be able to exclusively play an extract at the end of the show, but what can we expect to hear through the song? Greg - I'm a historian by training so we start going back in time a little bit, just to talk about exploration, and then we move forward through time. We go through various phases and we end up with a little bit of artistic license with Voyager returning into the solar system… Stuart’s shaking his weary head there... In very very theoretical terms because the Voyager ships are on a galactic orbit. I've used that artistic license just to make a satisfactory ending to the song. Izzie - David, you've made a few albums so why exploration this time round? David - Well it's a human thing, isn't it? The desire to seek and to reach out and to observe and to be inspired about the world around you. It’s very much a part of what is to be human. Greg mentioned we're a progressive rock band, and part of the expectation of being in a progressive rock band is that you will reach, you will strive and it’s extended song format. Exploration is something that sits really well within our remit and it's also about mankind's insatiable curiosity and tenacity. Reaching out into space and Big Big Train reaching the big things, big ideals and Voyager is a grand scale thing fits very much into our ethos. Izzie - Amazing. And very briefly, when can we expect the full album? David - It's going to be May! Izzie - You heard it hear first! Thanks so much David. David Longdon and Greg Spawton, they're from Big Big Train. And if you want to hear how that Voyager track sounds, well you'll just have to wait till the end of the show.